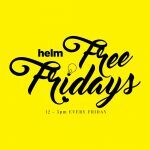 HELM - Shared Office & Coworking | Want to Start the New Year With TONS of New Clients? Here’s How. Want to Start the New Year With TONS of New Clients? Here’s How. A few months ago we told you about Helm member and sales and marketing coach James Ashford. In this article, we gave away 3 of James’s brilliant secrets for attracting new clients. Today, to help you start 2017 with a BANG, we’re going to let you in on a few more of James’ methods that will really help maximise your profits! This may sound obvious and pretty straightforward, since most people have heard of Facebook ads, but the main problem is, most businesses don’t know how to use them successfully. The amazing thing about Facebook Ads is how targeted they are. If you know your audience you can zone right in on the people that need your product / services the most. The problem for most businesses is getting people to notice their ad and react to it. Remember, most people are on Facebook to see a funny cat video or catch up with friends news – your interruption is probably not welcome. This is a social space and you won’t get away with treating people like crap. How do you overcome this? By not directly selling your stuff and shoving it in their face. You need to give them something, something that rewards them for taking the time to stop by and read your ad. Try giving them free content that will drive them back to the helpful blog articles on your site and other free downloadable material. Adding a lead magnet to your website (or Facebook Ad) means that you’re giving value to someone before they’ve spent any money with you. By creating a lead magnet (ebook, audio, download, real book, free consultation or whatever you want to offer) you’ll be helping someone improve their life (for free) so they won’t mind giving you their email in exchange. Their email is marketing gold. Once you have this you can send them further emails building even more value and moving them further along your marketing funnel towards a sale. If you get as much from James’ advice as we do, you’ll be pleased to know that we’re offering the chance for you to meet and be coached by James in person – all for a small one off payment of £50. James’ coaching normally costs £997 so this really is a one off opportunity – you’ll be getting tons of insider info for next to nothing! 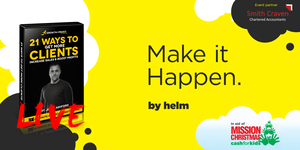 Make sure you don’t miss out by grabbing your ticket for our #MakeItHappen event on the 15th December before they run out. All proceeds from ticket sales are being donated to Mission Christmas: Cash for Kids. We’ll also be donating new, unwrapped toys so we’d love it if you could bring one along to donate as well. It’s an incredible cause and we’d like to thank you in advance for your generosity this Christmas – warm and fuzzy feeling included.